This month, we chatted with telecommuting attorney, Jack McMullen. 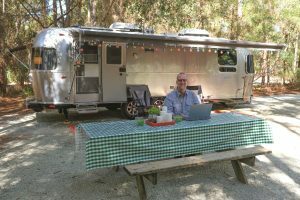 Nostalgic for days as a kid spent camping with his family and mindful that his 30-year legal practice has never required him to set foot in court, he and his wife several years ago began wondering if they couldn’t expand the notion of telecommuting. That his firm, GrayRobinson, has a progressive attitude toward working outside the office helped convince him and his wife to spring for an iconic 28-foot Airstream camper. Clients, too, have encouraged his pastoral form of extreme telecommuting. “They know I’m just as available to help them any time, no matter where I am,” he says. The couple’s three grown daughters also know mom and dad are easy to reach any time. Meanwhile, Jack hopes to begin extending his telecommute by venturing farther west and north to some of America’s more famous national parks. Of course, he admits some coworkers question his brand of telecommuting. “They ask how they can do it, too,” he says with a laugh. Tell us about your telecommuting while still an active Orlando-area attorney. I am a corporate, securities, and mergers and acquisitions lawyer, and virtually all of my work is conducted from within our firm’s offices. After almost 30 years of practice, I was looking to try something new to put a little more excitement and fun into my work and began to explore the idea of telecommuting part-time from state and national parks. As long as I have a good cell signal with which I can generate a Wi-Fi network for my phone and computer, I really can do my work anywhere. 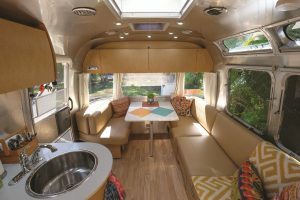 We’ve always loved the look and feel of Airstream travel trailers, as well as the tight-knit community of Airstream owners, so we began to investigate purchasing one a few years ago. Finally, we bit the bullet during the summer of 2016. Since then, we’ve been spending about 10 days a month traveling…and working as needed. I find working from the middle of the woods or at the beach to be very peaceful, and you sure can’t beat the view. All of my clients know and approve of my new work environment, and I am still able to provide them the same level of service as I would have sitting at my desk overlooking Lake Eola in downtown Orlando. We understand your law firm (GrayRobinson) CEO and president, Mayanne Downs, has been very supportive. Yes, Mayanne and Biff Marshall (our former CEO) have both been very supportive of my endeavors. Without their cooperation and the support of my other partners and clients, this lifestyle would not be possible. That is one of the great things about GrayRobinson. The firm has a very flexible and entrepreneurial spirit that allows its attorneys to forge their own career path in any manner that suits them and that still provides prompt and excellent service to our clients. Your wife travels with you, right? Yes, my wife Patti and our two-year-old boxer Lucy both travel with me. Patti is an interior designer and also works from the Airstream when needed for her client consultations and certain drafting projects. While Patti had never camped before and was a bit leery of this lifestyle, she has easily adapted to it and grown to love it. Needless to say, Lucy has a ball everywhere we go. This lifestyle allows us to spend a lot more time together, and we get to see some very beautiful sights along the way. Another benefit to camping as much as we do is that we get to meet so many adventurous, nice and down-to-earth campground neighbors everywhere we go. Please give us any specs or history you have for your Airstream. Our Airstream is an Airstream Flying Cloud 27FB. “Flying Cloud” is the model of the interior, and “27FB” means that it is 27 feet long and—with our floorplan—the bedroom is placed at the front of the camper. This allows the living space and dinette to be placed at the rear of the trailer, which is beneficial since most of the beautiful scenery is usually behind you when camping. The Airstream can sleep six people if needed (two better be pretty short! ), has two air conditioners, two 30-pound propane tanks, a solar and inverter package, and fresh, gray, and black water tanks of 39, 37 and 39 gallons each. These specs would allow us to dry camp (or “boondock”) with no hookups for about a week at a time. The Airstream also has two TVs, a great four-speaker stereo, and many other entertainment options via “streaming” through two Amazon Fire TV sticks. While we have no great interest at this time, it is also wired to attach cable television or a satellite receiver if you desire. I am a huge Bruce Springsteen fan, and we’ve named the trailer “Rosalita” as a tribute to one of his most popular songs. What’s your favorite thing about traveling in your Airstream versus staying in a hotel? Is “everything” a valid answer? First and foremost, it allows us to keep all of our normal travel gear in one place with no need to pack (other than groceries) before each trip. Second, it allows us to live in nature while still having the luxuries of a queen-sized bed, bathroom, and full kitchen. We love the fact that our Airstream has so many large windows and skylights that you really feel like you are outside in nature even when you are in the comfort of your tiny home. Third, other than the price of the trailer itself, it is a relatively inexpensive mode of travel. 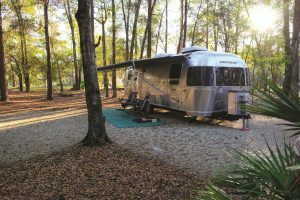 The price of our stays in the past have ranged from free (when boondocking), to about $24/night in Florida’s fantastic state parks, to $60-$125/night for a couple of the privately-owned parks we have visited on rare occasion. Finally, traveling in an Airstream allows us to take Lucy with us everywhere. My coffee maker is a favorite. There is nothing more relaxing than waking up to a fresh pot of coffee to drink outside in the quiet and natural surroundings we visit. We also travel with a BBQ grill, hammocks, and everything needed for a campfire each night. For work, my cell phone, MacBook Pro, Verizon hot spot, and WeBoost cellular signal booster are must-haves. We really enjoy many of Florida’s state parks. Most have large campsites, with plentiful trees or other vegetation providing a little separation and privacy from our neighbors—and also have electric and water hookups. They are also usually relatively close to a city for us to explore, while also having many outdoor things to do, such as hiking and kayaking. We’ve also found a couple of county-owned parks that are real gems (Fort DeSoto in St. Petersburg and Trimble Park in Mount Dora). We are looking forward to visiting Stone Mountain in a couple of months to visit two of our three daughters who both live in Atlanta. What are some favorite meals onboard or restaurants on the road? While at the campground, we enjoy grilling out a wide variety of camp-style dishes… and Patti also makes a mean pot of chili. As a designer, Patti loves to decorate the campsite and picnic table with festive lights and decorations, so you really cannot beat the dining ambiance. We do usually venture into town a couple of times each trip, and we tend to gravitate to any restaurant with a deck or patio on any type of water that allows us to dine with Lucy. Well, in the RVing world, “funny stories” are usually stories of serious blunders or unfortunate mistakes that have become “funny” with the passage of time, and we are fortunate not to have any of those so far. However, since we are constantly towing a 7,600-pound portable house behind us, the chances for “funny stories” in the future are not remote. Nonetheless, we have made countless fantastic memories from living in and experiencing nature in ways that most people do not have the chance, time, or desire to do. We hear you’re going to start venturing even further north and west to visit more national parks, right? That is absolutely our goal. Under our current schedule, we take two five-day trips a month. This allows us to comfortably travel up to four or five hours away from home each trip, while allowing us three full days in our destination. The problem with having Central Florida as our home base is that we are located in the southeastern tip of the country, and it is tough to get very far during a five-day trip. In the next year or so, we plan to make a concerted effort to begin taking frequent one- or two-week trips to stretch our Airstreaming boundaries and explore more of the Southeast U.S. and thereafter journey on to discover all of our country’s great national parks, which are largely west of the Mississippi. Utah, Arizona and Wyoming will be our first targets. I also love photography and usually have a camera in my hand during all of our travels. Since my job does not provide many opportunities for creative or artistic expression, taking and sharing my photos with others provides me an enjoyable and stress-relieving outlet.